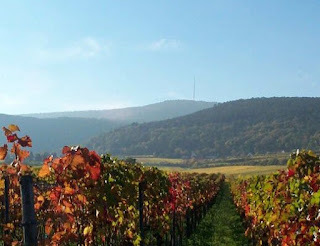 The Pfalz (Palatinate) is a wine growing region in the south-west of Germany. It stretches some 80 kilometers from Bad Dürkheim in the north via Neustadt an der Weinstraße in the center to Landau in the south. Situated under the lee of the Palatinate Forest on the Haardt mountains, its climate is much like that of Alsace in the south or Baden in the east and it is one of the warmest, sunniest and driest of German wine regions. The vineyards are planted on a mixture of sandstone, loess, clay and volcanic soil. Here, in the undulating countryside just north of Landau lies the little village of Flemlingen, where the Minges Family have been producing exquisite wines for 8 generations. After a very warm welcome to the estate, Theo Minges, his wife Martine and daughter Regine treated us to a tasting of many of their wines that speak of great passion and dedication to create innovative products that also respect the regions traditions. We tasted many wonderful wines, reaching from the modest Weißburgunder to the acclaimed Riesling. Of course we could not leave without purchasing several boxes to help remind us of this fantastic experience. Once we got home, we found several gifts from the Minges family, hidden between the bottles we purchased. One of these gifts was this special wine, which upon tasting rendered us thoroughly stupefied by its amazing, full-bodied yet elegant and delicate characteristics. A truly remarkable wine. We shall need to return to Flemlingen soon to purchase some more! In the glass the wine shows a deep lemon color, almost going to pineapple. 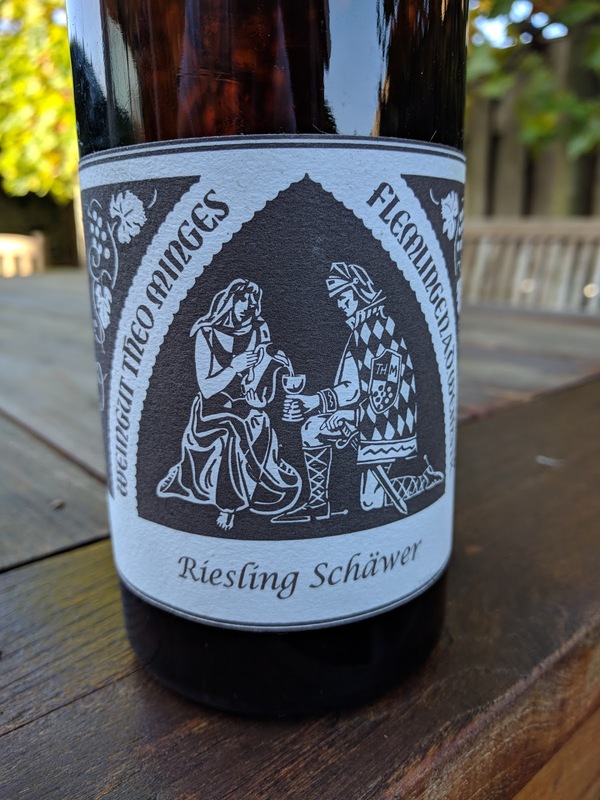 Characteristic Riesling in the nose with delicate flowers, green jasmin tea, minerals and a subtle, almost spicy edge. Crisp, tingling flavors on the palate, with ripe tropical fruit, rose hips and white pepper. Long lingering, remarkable finish with a wonderful balance of acidity, minerals and stone fruits. This wine is already amazing now but also has great potential for storage - waiting patiently in your cellar to evolve into a truly magnificent Pfalzer Riesling. This wine works well with seafood and oriental cuisine such as Indian, Indonesian or Thai. Also good with sushi, veggies, garlic and lighter poultry or pork dishes. The Minges estate is member of the VDP (Verband Deutscher Prädikatsweingüter), the German wine grower association for quality wine. The classification 'VDP Grosse Lage' (great site), indicates the highest quality according to regional designations that are typically associated with a single vineyard or small grape growing area, similar to the French 'Grand cru'. Dry Riesling wines with the VDP classification will be labeled as “Qualitätswein” and “Trocken” (“dry”) and can also be labeled with the ripeness terms from the Prädikat system (e.g. Spätlese, Auslese, etc). 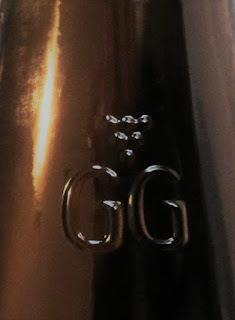 The label GG, seen here embossed on the bottle, stands for Grosses Gewächs or great growth. It is used to identify some of the finest wines in Germany. All Grosses Gewächs comes from a Grosse Lage. Like the French Grand Cru, these wines take the name of the vineyard and not the village. To make the GG grade, yields must not exceed 50 hectolitres per hectare, and the grapes must be physiologically fully ripe and also hand harvested. The VDP is an invitation-only, industry body numbering around 200 exclusive producers and its rules are therefore not officially part of German wine law. 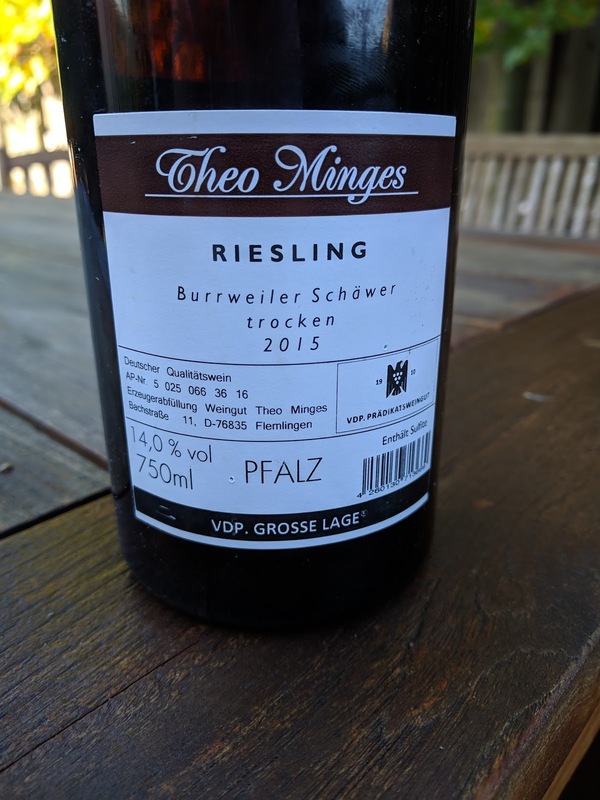 Understanding German wine law with its labels and qualifications is a completely different story, maybe for a future post.